When Jeremy Roenick plays hockey, it's rarely just a game. Instead, it's a technicolour event featuring passion, feisty opinions, drama, and plenty of flashy skill. On November 10, 2007, he became the third American-born player (Joe Mullen and Mike Modano were the first two) to score 500 goals. His spectacle on ice was first noticed when he led Thayer Academy to a high school championship. En route, he scored 84 points in 24 games. He then finished the season by skating for Team USA at the World Junior Championships of 1988. With such abundant talent on the rise, Roenick was sent to nurture his skills with the Hull Olympiques of the QMJHL. There, he shone just as brightly, netting 70 points in 28 games. He then returned to the World Junior Championships where, the second time around, he led all scorers and was voted a First-Team All-Star. By then the Chicago Blackhawks had heard of Roenick and picked him up in the 1988 NHL Entry Draft. He jumped straight from the World Juniors to the NHL where he has remained ever since. With the Hawks, he soon became a passionate team leader and offensive star. He scored over 100 points for three-straight seasons between 1991 and 1994. By 1994, however, injuries began to slow him down as he suffered through a dislocated knee, a concussion, and a sprained knee. Nonetheless, he managed to remain a feisty and productive member of the cast. After parts of eight seasons with Chicago, Roenick was dealt to the Phoenix Coyotes. 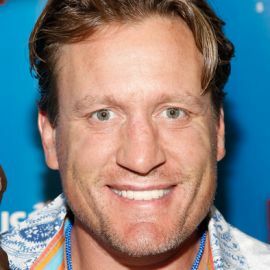 With the Coyotes, Roenick continued to be a physical, emotional, and scoring leader for the club and was rewarded for his strong play over the years and was named to 1998 U.S. Olympic team which competed at the Nagano Olympics. Over the years, the team gradually began to feel the financial pinch. When the team changed ownership, it was decided to unload expensive contracts, Roenick's included. In the summer of 2001, Roenick was traded to the Philadelphia Flyers and in his first season with the team compiled 67 points and surpassing 1,000 points for his career. Roenick's strong play both offensively and defensively in 2001-02 earned him a roster spot on the 2002 U.S. Olympic Silver medal team in Salt Lake City. After two seasons in Philadelphia, Roenick was dealt to the Los Angeles Kings in the summer of 2005. Retired NHL Player; One Half of the "Bruise Brothers"